The Christmas countdown has begun! 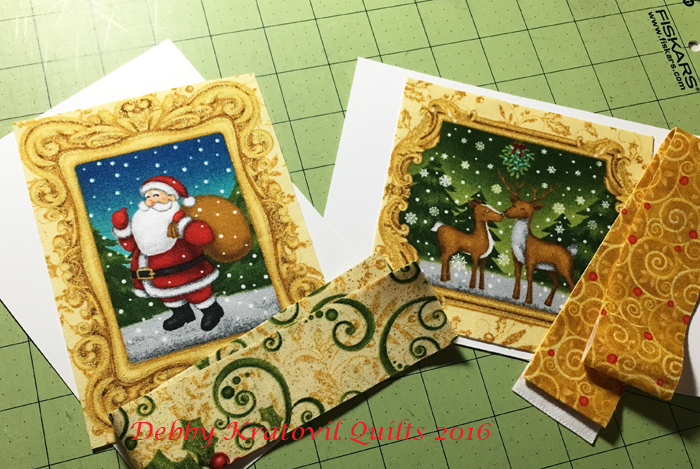 This week we'll be sharing five holiday-themed tutorials to add to that festive feeling. Today Debby Kratovil is here playing with the Mistletoe collection. Wait until you see what she does with this adorable panel! You'll never buy Christmas cards again. Enjoy her tutorial (don't miss the link to make a cute child's vest as a bonus!) 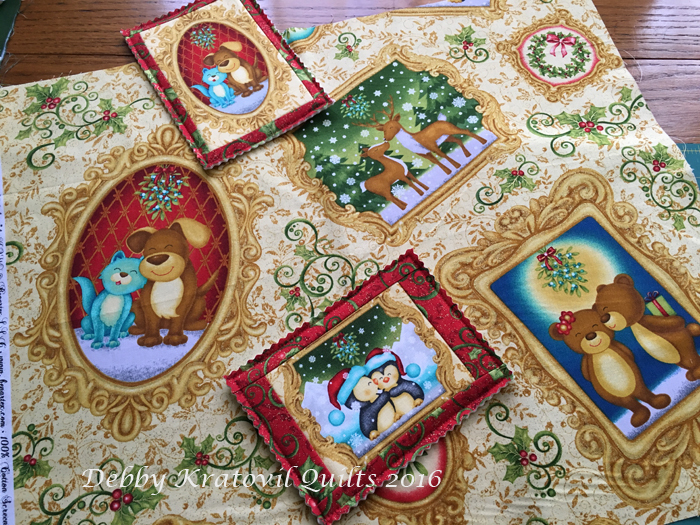 and then head over to her blog to enter to win a holiday fabric bundle. I love fabric panels. 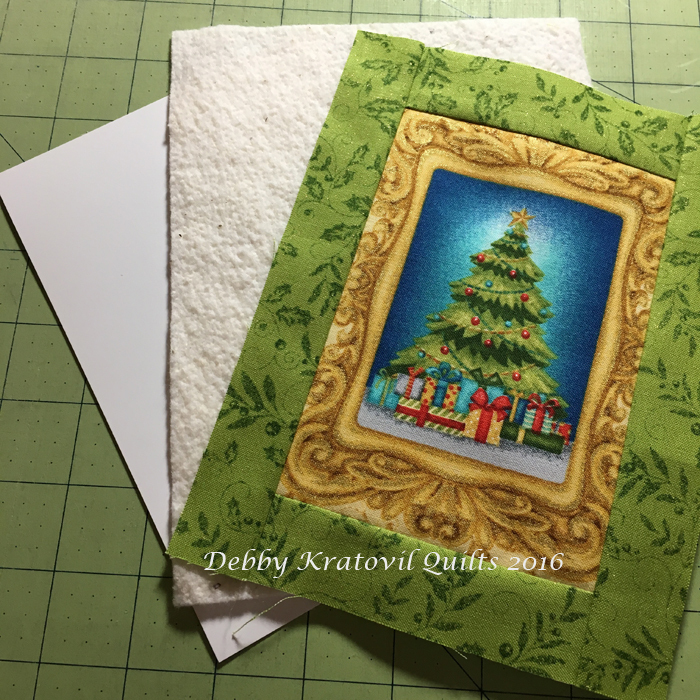 They capture so much within a large expanse of material, but when I received the Mistletoe collection I realized I couldn't do anything other than make another quilt. Or could I? I really didn't want to make one more quilt to add to the zillions I have here. Hmmmmm. I put my thinking cap on and the wheels were spinning. First, let me show you the group of fabrics I was given - don't you just love that stripe?! OK. Where's the panel? Now you can see my quandary. So, I cut it up. Oh, yes I did. I honestly did! Gasp! I saw those lovely motifs - 4 on the top and 4 on the bottom - as something to play with. I carefully added enough fabric to the motif edges so I didn't cut them off. Mr. and Mrs. Snowman can get their berry wreath garland sliced. See, they're still smiling! I guess that's because they're under that mistletoe, getting ready for a big smooch! You may be asking: what is she going to do with those panels? 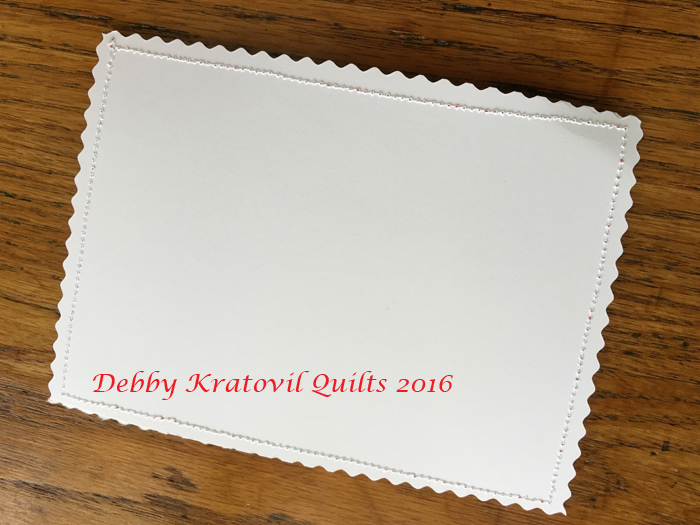 Oh, probably make a book or use them in a smaller quilt. Ha ha. Never guess what's in my brain. You will be disappointed every time! Oh, we're so happy! We're going to make a little girl happy! What's with the card stock? Add a little batting and we are ready to go! My almost 3 year old granddaughter loves to draw and color. 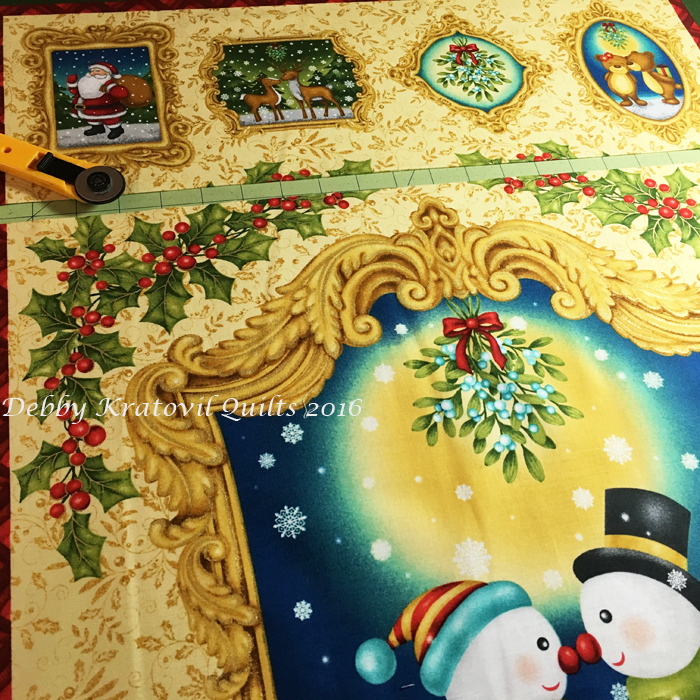 She will enjoy having some Christmas scenes on one side and a blank slate on the other. Maybe she can use these for her own holiday cards for her pre-school teachers or Sunday School teacher. But, first I must add some double sided tape to keep the layers from shifting. Yes, I will be sewing these layers on using my sewing machine! 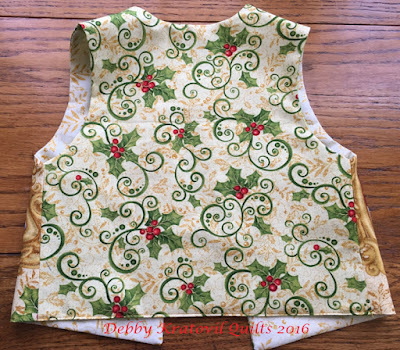 Sew the layers, trim using a decorative cutter blade (or some pinking shears - you know you have a pair and probably never use them anymore if you're a quilter). Now, let's see the seven I did make. 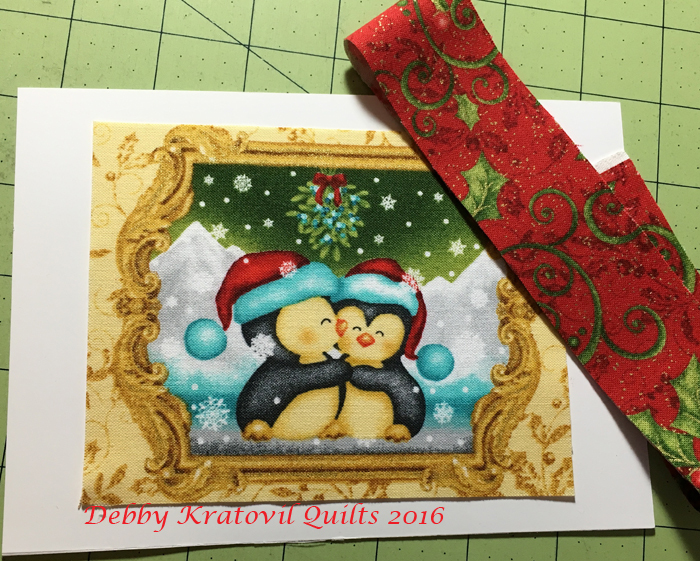 Then I got an idea for one of the fat quarters. I pulled out my trusty kids' vest pattern and discovered I could capture two motifs for the vest front. 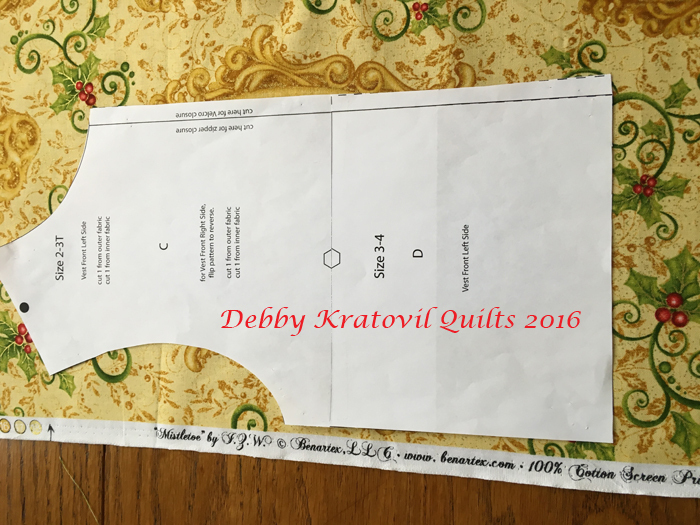 I was able to fit my vest pattern onto this fat quarter to cut out the two front units. See how happy the postcards are to know they will take more buddies with them to my granddaughter's house! Vest pattern placed so I could get the dog/cat panel on one side. I was able to get the kissing bears on the other side. Since I was working with fat quarters, I had to use a second one for the back; one for the inside back lining and another for the front inside linings. Works when your person is a little person! And the back of the vest is a 4th fabric. I still have that wonderful stripe and the center of the original panel. I'm sure something will occur to me. This was the easiest vest EVER to make. I found it online and used it for a previous post using the Firefighters Rock and Boys in Blue Collections by Benartex. You can see the steps for making the vest here: Firefighters Rock. 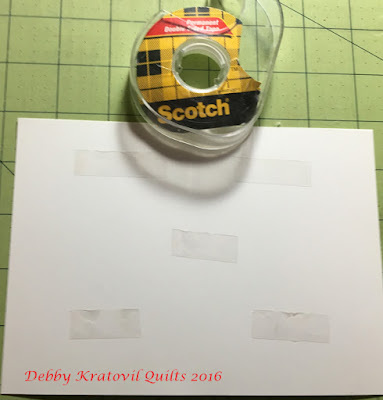 Make sure you look at the steps because it results in having NO raw edges showing and is a very creative approach to how the seams are worked. I love this technique! 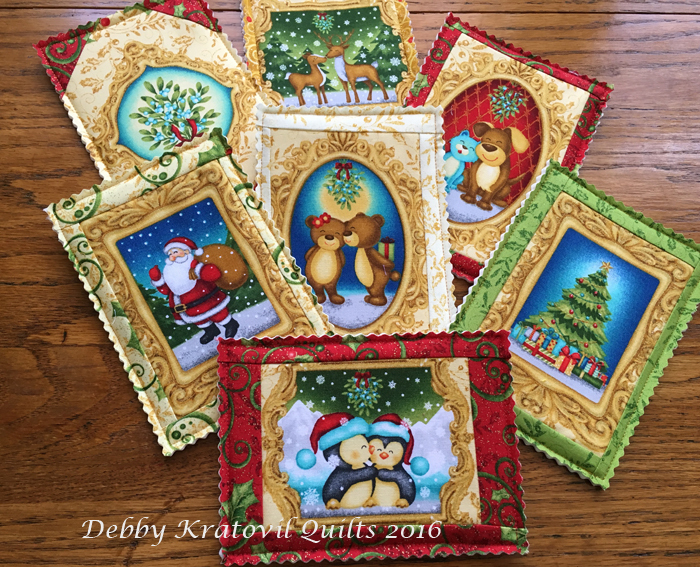 For a chance to win a bundle of one of our holiday collections, head over to Debby's blog. 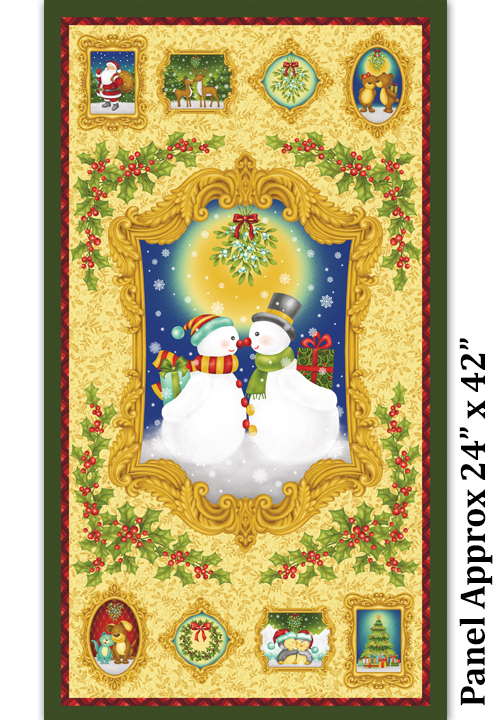 Make sure to catch all of the tutorials on our Deck The Halls Blog Hop! p.s. Looking for more holiday inspiration? Click here to check out the tutorials featured in our Christmas in July blog hop. Such a great idea. Debby always comes up with the best ideas. Thank you. So cute. I love Debby's way of thinking. I would never have thought of this. NEAT PROJECT! THANKS FOR SHARING! These ideas are brilliant! I started following Debbie after being introduced to her on one of your blog posts and really am delighted with all of her ideas and tutorials! 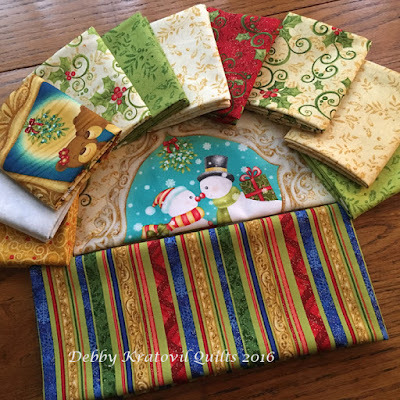 This is a magnificent fabric bundle to do these type of projects with! Thank you so much for sharing and have a fantastic creative day! 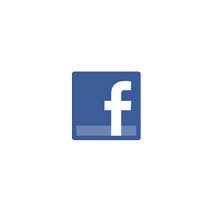 Your ideas are always great. Appreciate you sharing. Love these ideas. Sometimes panels are so hard to use. She is a smart Lady! Love the vest. Ooooh, grammy! you are gonna have one happy granddaughter. Can't wait to see what you do with the kissy-kissy snowpeople. What a cute vest and creative way to use a panel. Debby comes up with some great ideas! Great idea!! I love it!! Awesome ideas and I agree, that stripe is a keeper (well, yes, it needs to be used eventually, but it's really neat). Such a great idea to make a little one happy! Such cute designs. 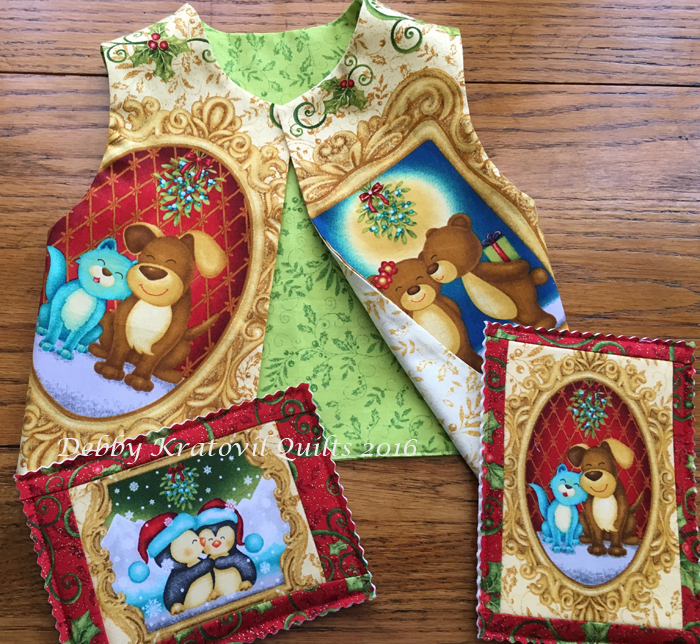 I loved how you used a panel to make cards and a vest. I love the strip fabric too. Thanks for the ideas using a panel. Oh, wow, what great projects. I love both ideas. Someone just gifted me two snowmen panels. I will have to think about whether they would work this way. Thank you for enlarging the box I think inside. Joey the Shop Dog - In Fabric! Double the Chickadees, Double the Love!